Already own a home in the Central Park subdivision? Thinking of selling? Click here and read about current search trends & our web network. Central Park homes for sale in Fairhope, Alabama are all listed on this page and along with current listings, an interactive Google map, pictures, property details, and other helpful info for the homes for sale in the Central Park subdivision in Fairhope, Alabama. Central Park is an older neighborhood with a country feel with it's large hardwoods and oaks. 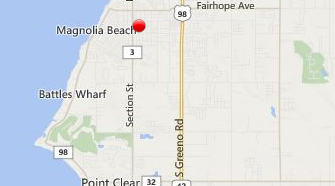 This well established Fairhope area provides homes as early as 1950's. Being in the heart of Fairhope, you will enjoy walking to area shops, restaurants, parks, and everything else. These quaint Fairhope homes have between one and three bedrooms. From Greeno Road South, turn right on Fairhope Avenue. Central Park in Fairhope is located in a central area behind Thomas Hospital, between Greeno Road and Section Street. If you need further info, have questions or would like to schedule a viewing for any of the homes for sale in Central Park or any other properties in the area, please email info@condoinvestment.com or call (251) Area-Pro (251-273-2776) for immediate assistance.